In years past the Macy's fireworks display could be awesomely seen from Brooklyn, Manhattan, Queens and even Staten Island. Those were the good old days. Now they're going up in the Hudson again -- and don't get us started on why New York City would shoot up fireworks where only one borough and New Jersey can see them. Want to see the fireworks from Brooklyn anyway? We don't blame you. 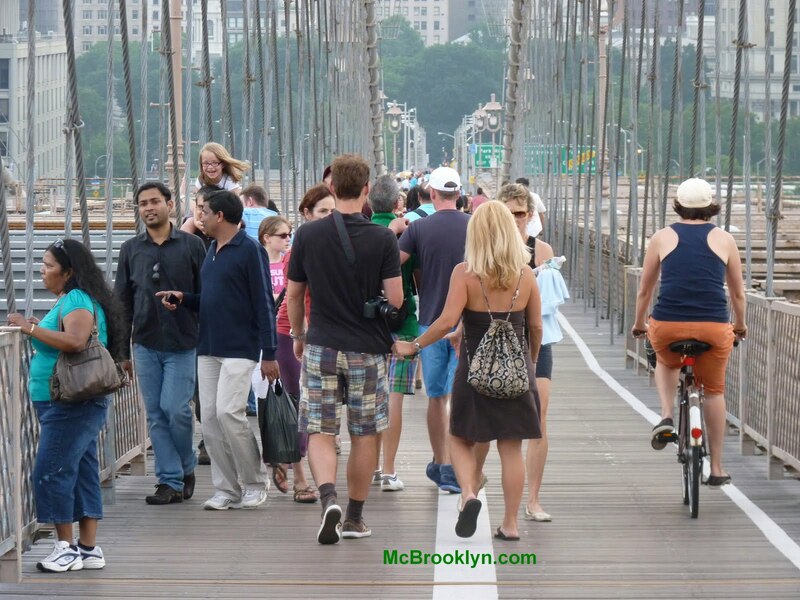 Over the past couple of years McBrooklyn has scouted out the best places in Brooklyn to watch the Hudson River fireworks. You can read our report listing the best Brooklyn fireworks views here. UPDATE: Good news from Williamsburg! 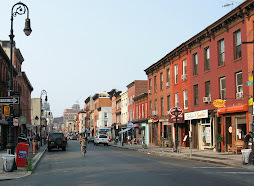 After Heights Books moved to Smith Street from Montague Street in Brooklyn Heights we didn't have the opportunity to shop there as much. Sadly, the shop closed earlier this year, and now Brownstoner hears that an eatery will be moving into the Smith Street location. It's a beautiful night for a workout! 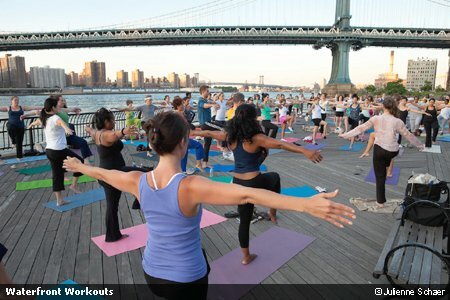 Join Lou Cornacchia, founder of Cobble Hill's Body in Balance Studio, for sunset pilates on Pier 6 in Brooklyn Bridge Park for an Intermediate Pilates Mat Class tonight at 7 p.m.
Lou's teaching remains true to the basic tenets established by Joseph Pilates. Students will learn proper technique, core muscle strength, spinal alignment and shoulder stabilization. Classes are open to ages 16 and older. Pilates experience is suggested. Students should bring a good thick mat and a Dynaband. Participants must complete a waiver form, which can be downloaded (Waterfront Workouts Waiver) and filled out in advance, or completed before the class. 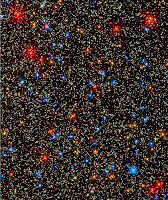 Join the Amateur Astronomers as they guide your eyes to the wonders of astronomy. 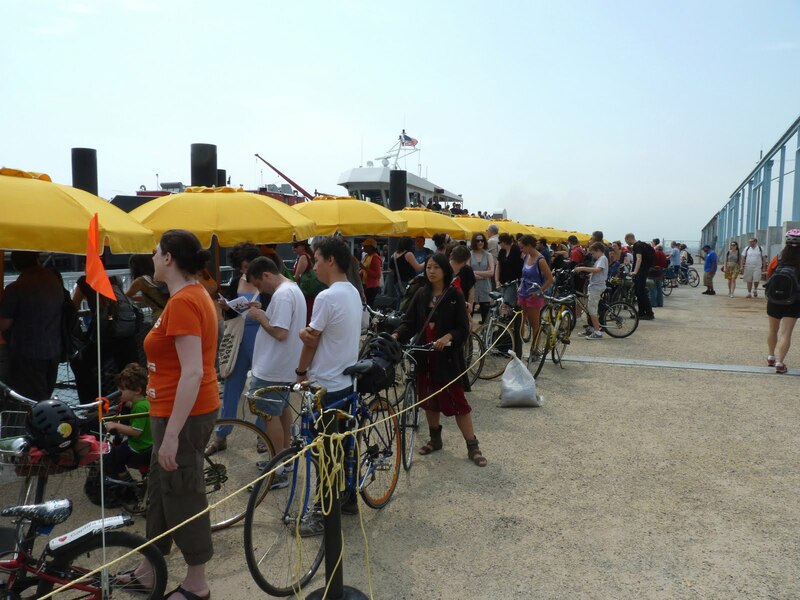 Look for the telescopes on the Pier 1 promenade in Brooklyn Bridge Park tonight from 8:30 - 10:30 p.m. Enjoy a cold, refreshing Brooklyn Brewery beer at the Brooklyn Historical Society. This summer, BHS will host monthly Brooklyn Brewery beer gardens the last Thursday of every month, starting tonight from 7 - 9 p.m.
Brooklyn Brewery will be on hand to pour and talk beer (if you like). This week Brooklyn's All City Street Art, the international graffiti app for iPhone, will be on site projecting some of Brooklyn's finest street art and hosting trivia. Download the app and study up for a chance to win a cold beer or two. Factory Fresh will be onsite and artwork from Leon Reid IV and Skewville. 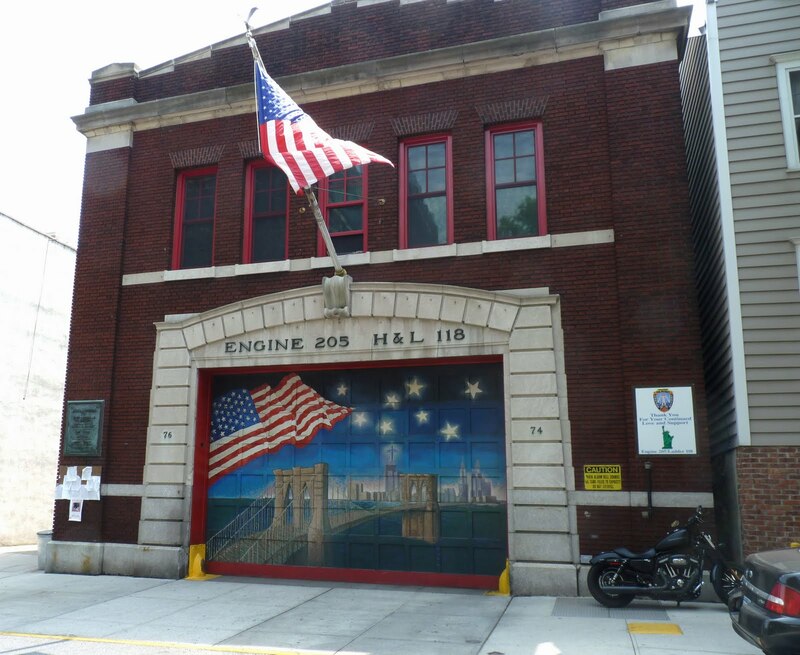 BHS’s first floor galleries will be open during the event-- come explore Home Base: Memories of the Brooklyn Dodgers at Ebbets Field and Painting Brooklyn Stories of Immigration and Survival. 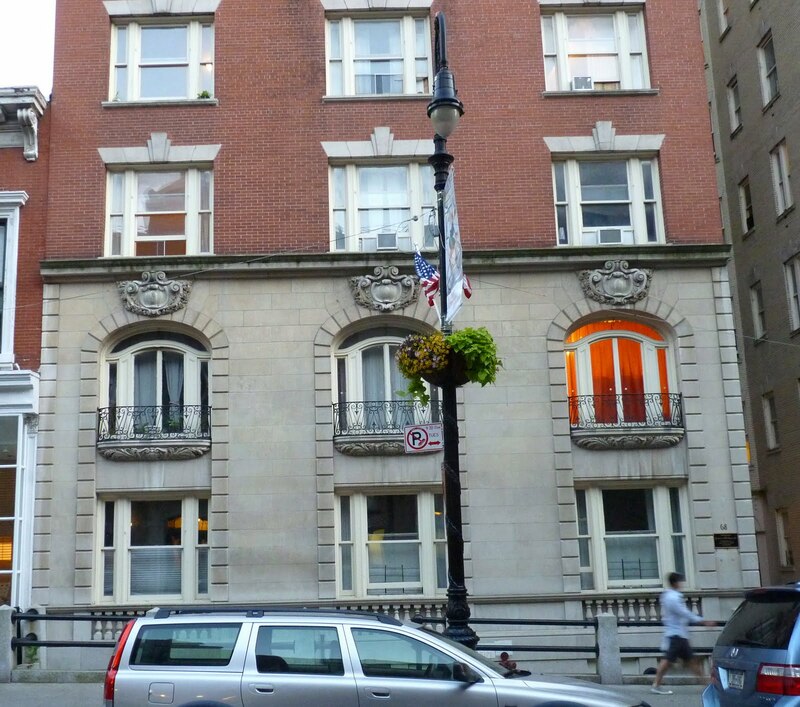 128 Pierrepont Street June 30th, July 28th, and August 25th. Drink tickets $5 each. Exactly Where On Columbia Street, Brooklyn, Is This? 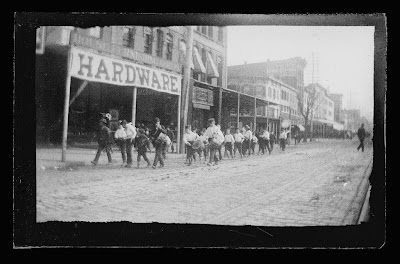 This photo was taken by George Bradford Brainerd on Columbia Street in Brooklyn sometime between 1872 and 1887. 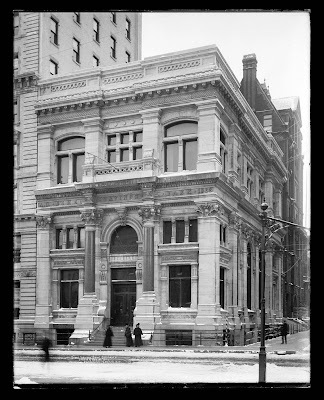 The Brooklyn Museum would like someone to suggest a more exact location so it can be geotagged on Historypin. Dozens of historic Brooklyn photos have been geotagged already, such as the photo below of the Dime Savings Bank by Irving Underhill , at the corner of Court and Remsen Streets in Brooklyn Heights, from somewhere between 1896-1950. 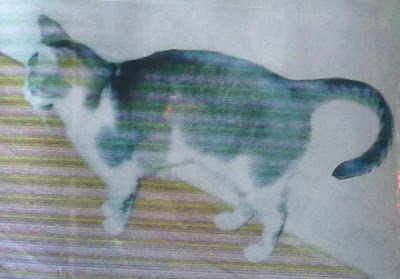 Here are the Brooklyn photo mysteries that have already been solved. 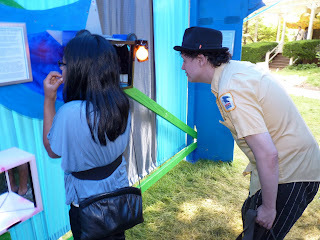 Here are the photos that still need geotagging. We love bikes. We ride bikes. 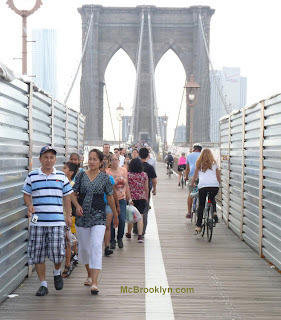 But we also like to walk on the Brooklyn Bridge, along with thousands of other pedestrians. We try to stay in the half of the walkway reserved for walkers but at rush hours, midday or on weekends there are so many pedestrians you feel like you're in a cattle chute. 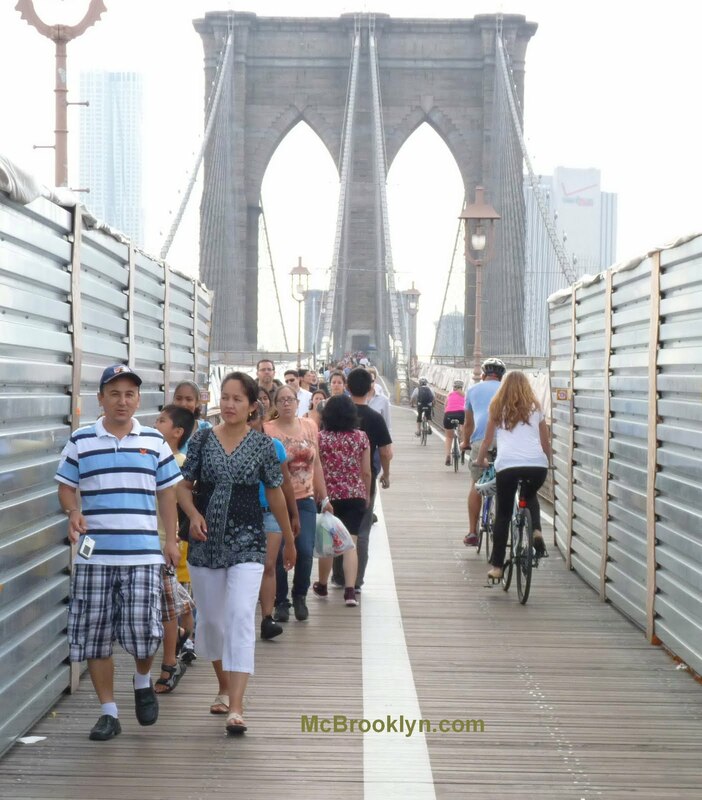 Why should half the bridge walkway be reserved for bikers? There are hundreds of times more walkers. Pedestrians can't get around each other. If a tourist stops to take a photo, walkers have to take their lives into their hands and duck into the bike lane, risking injury or worse. It's dangerous for bikers, too. Pedestrians in the wrong lane cause bike crashes, and bikers have been having collisions for years in their narrow lane. 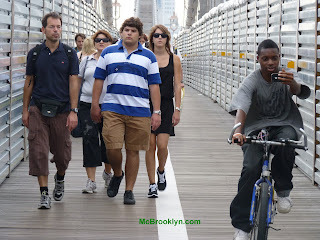 Though most bikers are civil, a sizable minority treat the bridge like a race track. They ride in a hunched over position to gain speed as they blast their way along. If tourists wander blithely into the bike lane this type of biker waits until they are almost upon them, then lets out a rude and frightening roar. They smugly tell themselves that the tourists are stupid idiots and deserve to be terrified. Not all bikers do this. Most are just nice people out for a ride. But during one walk over the bridge about five will. Runners often have to run in the bike lane because there's no room in the pedestrian lane. Children dart out into the bike lane. Why wouldn't they? It's a scenic bridge walkway, for goodness sake. If a child gets hit by one of these speeding bikers the result will be tragic. Bikers have a hard time in this city. People open car doors on them without looking. Police give them tickets for things that aren't even against the law. 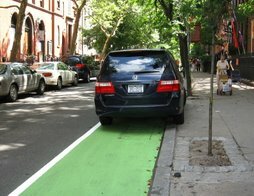 Cars park in the bike lanes all the time. Riding a bike is healthy and more people should do it. But the resources on the Brooklyn Bridge are not adequate for the sheer numbers of pedestrians and bikers. - What if the city installed rubber speed bumps on the walkway? 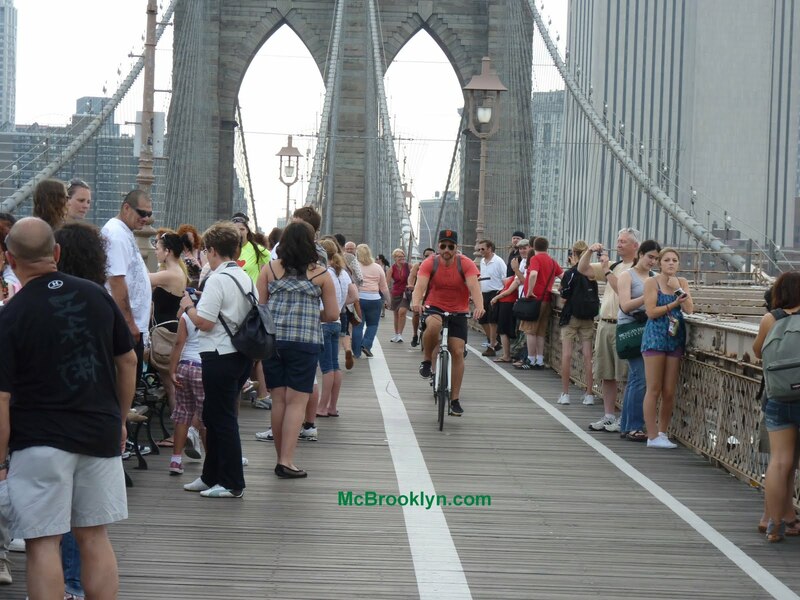 - Or made bikers dismount and walk their bikes when the bridge was crowded. 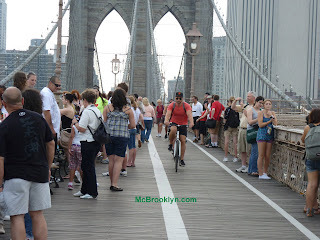 - A Streetsblog biker suggests limiting biking to the hours of 5 - 10 a.m. Another suggested closing the bridge to cars on weekends. Another suggested a new deck for bikes above the cars. It was inconvenient but much safer. Helicopter Buzzing Brooklyn Heights, Tuesday 9 p.m. Anyone? A helicopter has been buzzing Brooklyn Heights since about 8:45 p.m., flying between the 25 and 30-story level over Cadman Towers and Cadman Plaza Park. In the dark it's hard to tell what color it is but the copter is dark, possibly black. No spotlight. Despite assurances from Parks & Recreations officials that Carroll Park would once again be allocated a playground associate for summer 2011, the Friends of Carroll Park discovered earlier this month that funding was abruptly revoked. After the ensuing community outcry, Councilman Brand Lander and his staff were able to restore funding to bring back longtime associate Kathleen Henderson (above), at least for the time being. 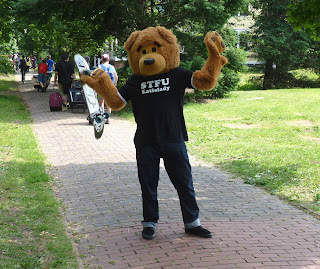 Long term funding (i.e., next summer) for the summer associate position is not guaranteed, however. While children in years past deserved summer recreation, it's so much more important nowadays that the top 1 percent of New Yorkers pay less in taxes than they did when things actually worked. Improv leading to sketch comedy: That is the plan at the Brooklyn Lyceum. Want to try out? Meet with the Frogmen; send them your headshot, resume/CV and writing samples. In commemoration of 1955, the year the Dodgers won the World Series, the historic Brooklyn Lyceum is putting out a comedy call to arms seeking 55 gifted individuals. The landmark institution is seeking a confederation, of writers, actors and improvisers who will provide the basis for a weekly sketch/variety show in the grand tradition of the original Not-Ready-for-Primetime Players (only better, of course). Of the 55 talented folks chosen to bring this all to life, 32 will be part of the primary show. 8 as tech, 8 as writers, 8 as featured actors and 8 highlighted performers. The remaining 23 will host a weekly improv show (along with teams and troupes invited from across the country) which will serve as a showcase and testing ground for material and performers to rotate into the primary performance. Next organizational meetings are July 11th, 18th & 25th from 6PM to 7PM. 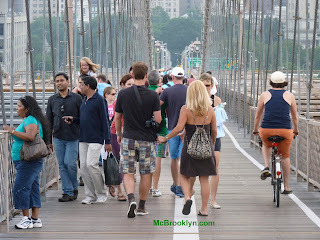 Live from New York, or more appropriately, Brooklyn... it could be YOU! 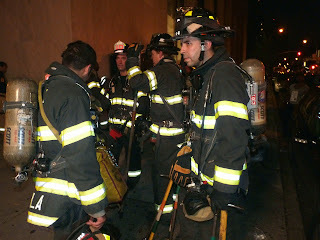 For more information visit http://www.gowanus.com or email frogmen@gowanus.com. A P.S. 154 student, 6-year-old Aidan Seeger, was recently diagnosed with ALD and desperately needs a bone marrow transplant. ALD is a genetic determined neurological disorder and affects the brain with demyelination (nerve cells throughout the brain are destroyed). Aidan first started showing symptoms in February but was only diagnosed recently while at the University of Minnesota. 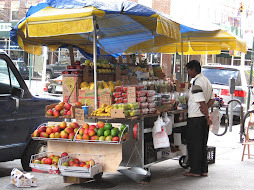 Avenue Brooklyn, NY, from 8:30am until 3:00pm in the MMR. Please stop in and sign up to join the Be the Match Registry. Symptoms of this disorder include visual disturbances, auditory discrimination, impaired coordination, dementia and seizures. Symptoms progress rapidly and lead to a vegetative state within two years and death anytime thereafter. There is no cure for ALD, but there are some experimental methods available. One treatment is a bone marrow transplant. The idea is to replace cells that have the defective ALD gene with cells that have a normal ALD gene. The family has requested that this information be kept from the children as Aidan is not yet aware of the details of his illness. They are also asking that he be treated as he always has been. 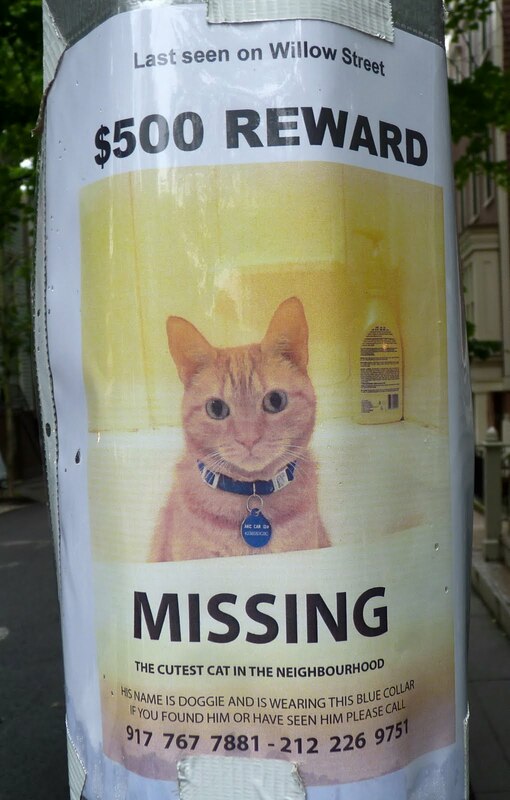 In addition, P.S. 154 is raising funds to help the family with expenses such as medical, airfare, and possibly an apartment rental in Minnesota. Any financial help you can provide is greatly appreciated. Cash and checks are accepted. 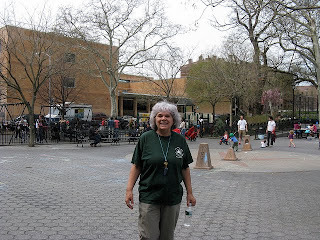 Checks should be made payable to Elisa and Bobby Seeger and they can be given to Sam Ortiz, the principal of P.S. 154 or Eric Havlik, the Assistant Principal of the school. Joining the Be The Match Registry is easy. Patients need donors who are between the ages of 18 and 60, meet the health guidelines and are willing to donate to any patient in need. Bring photo ID. You'll be giving four swab samples of your cheek cells to be tissue-typed. A work stoppage by operating engineers could stop construction on major projects worth nearly $10 billion and idle more than 11,300 workers, according to Crain's NY. Projects that could be halted include Forest City Ratner's Barclays Center (Atlantic Yards) in Brooklyn, which employs 1,000 construction workers, says Crain's, including crane operators. Builders are stockpiling materials on upper floors. The contract deadline is a week away. More here. 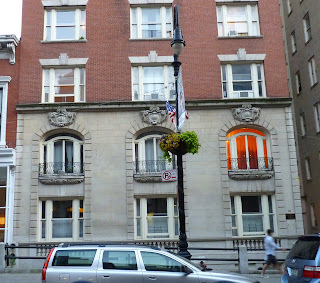 An ordinary building on Montague Street, Brooklyn Heights -- but something orange glows brilliantly behind one window. After countless hours of disruption, protests and marches, Mayor Bloomberg and the City Council managed to work out a budget Friday that doesn't require the firing of more than 4,000 teachers and the closing of 20 fire companies. Which was a really stupid idea in the first place, Mayor. The Council expects to vote on the budget Tuesday. Those fireworks over New York City tonight were brought to you courtesy of The Dance on the Pier, part of Gay Pride Week. The event, according to NYCPride, was "born out of a time when LGBT New Yorkers could not dance openly and proudly together." The historic New York City Department of Purchase Storehouse, known as the Purchase Building, has been torn down, but its boiler house lives on in the newly renovated Brooklyn Bridge Plaza at Fulton Ferry Landing, next to DUMBO. According to the NY Times, in 1977, when the Purchase Building was declared part of the Fulton Ferry Historic District, preservation officials noted the boiler house, with its "boldly designed, tiered and faceted chimney-stack." In 2006 the New York City Landmarks Preservation Commission voted to demolish the Purchase Building to make way for Brooklyn Bridge Park. But the boiler house survived and has been renovated. 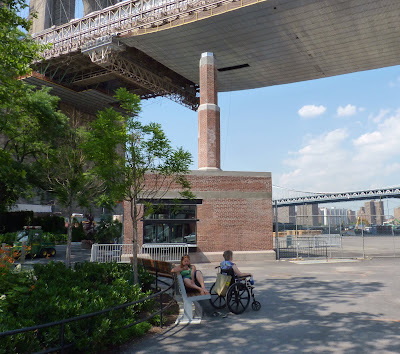 Now called the "Smokestack Building" by Brooklyn Bridge Park folks, the unusual little structure will be used as "a future park concession," according to BBP. In the photo above, you can see that a service window has been grafted onto the building. 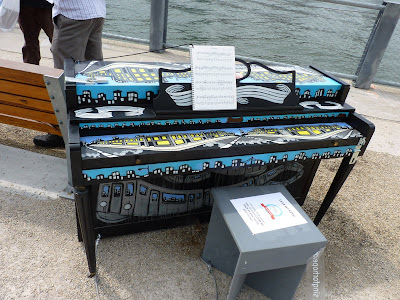 Sing for Hope, a NYC-based non-profit, has placed 88 pianos in parks and public spaces throughout the five boroughs through July 2. The beautiful piano above, painted by Adam Suerte, is in Brooklyn Bridge Park on Pier 1. It's just waiting for you to play it. 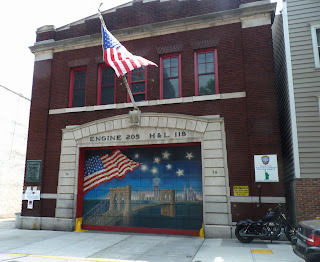 Even in the rain Engine 205 and Ladder 118, in Brooklyn Heights, is beautiful. Money is pouring into the Kickstarter campaign to build a giant, plus-shaped floating pool in Brooklyn, preferably off Brooklyn Bridge Park. Just a few days after the designers Kickstarted it, the +Pool campaign surpassed its goal of raising $25,000. As the Brooklyn Eagle reported Friday, an engineering company’s feasibility report has confirmed that the Plus-Pool is technically possible. Now the design team is raising money to test the filters. After testing is completed, the biggest hurdle the pool faces will be the regulatory, permitting and approval process, one of the designers told the Eagle. “We’re just starting off. That will be by far our biggest challenge. We need to finish our filtration report before we go there." This caught some folks by surprise: The Brooklyn Eagle reports that Dominick Stanzione, head of Long Island College Hospital (LICH), is leaving his post as executive director of what is now University Hospital of Brooklyn at Long Island College Hospital (LICH). Last month Stanzione said he would be staying on at the hospital. As of yesterday, even Ronald Najman, spokesperson for SUNY Downstate (which took over LICH), said that he wasn’t aware that Stanzione planned to step down. But Assemblywoman Joan Millman appears to have some insight into Stanzione's plans. Musicians were everywhere: on the sidewalks, in parks and in nooks and plazas. 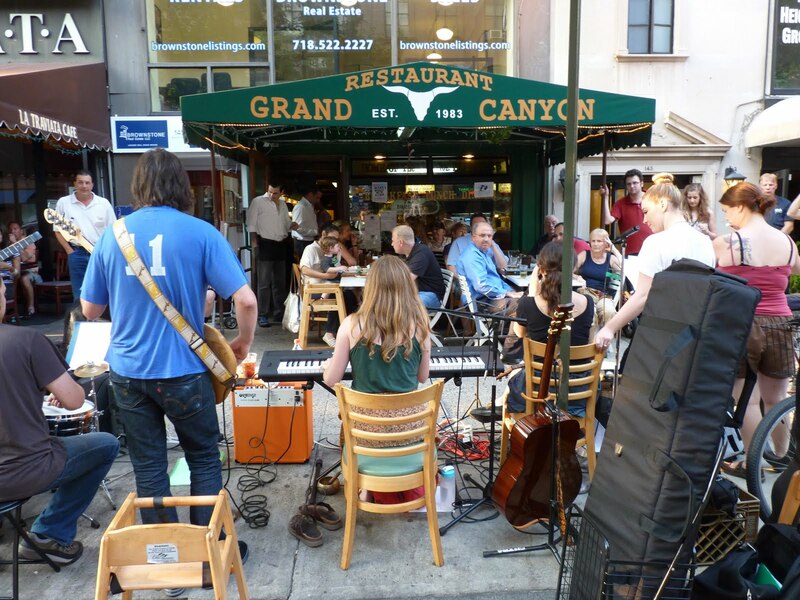 In Brooklyn Heights, a folk group called MELA -- combining sweet vocal harmonies with piano, guitar, flute, ukulele, bass and percussion -- played the dinner hours on Montague Street in front of the Grand Canyon restaurant. 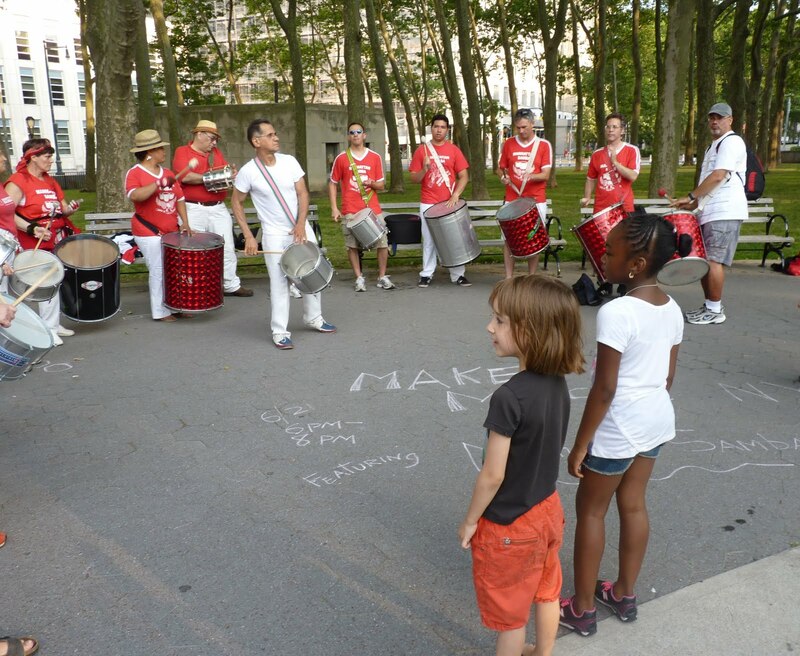 If you were anywhere near Cadman Plaza Park in Downtown Brooklyn (and by anywhere we mean at least a half mile) you heard Manhattan Samba and their driving percussion. 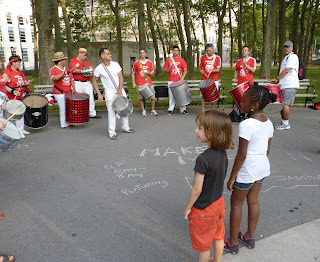 Manhattan Samba is a Brazilian samba drum ensemble. 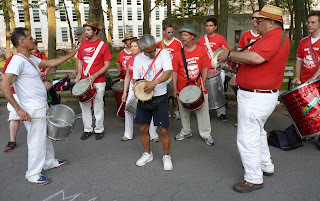 The group is a traditional Brazilian "bateria," one of the drum groups that accompany the yearly carnival parades in Rio de Janeiro. In DUMBO, in The Archway under the Manhattan Bridge, Nick Franglen (of Lemon Jelly) played a 24-hour piece on a Theremin. The PitchBlak Brass Band played jazz on Water Street. The Soulfolk Experience entertained at Brooklyn Borough Hall. Dan Aiello performed pop on Flatbush Ave. 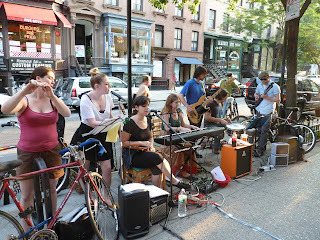 In Carroll Gardens, MaDDan & NottyMinds played Jazz; Naomi Frank provided funk. The Birdhive Boys played on Smith Street. 18 different performances took place in and around Fort Greene! And 85 in Williamsburg! Three shows took place at Grand Army Plaza -- including a choral performance by the Youth Choir of First United Methodist Church, Oak Ridge, TN. While Make Music New York day has ended, there are still Sing for Hope Pop Up Pianos -- 88 of them -- scattered all over the city, just waiting for folks to sit down and play. Sometimes there are pop up concerts as well. 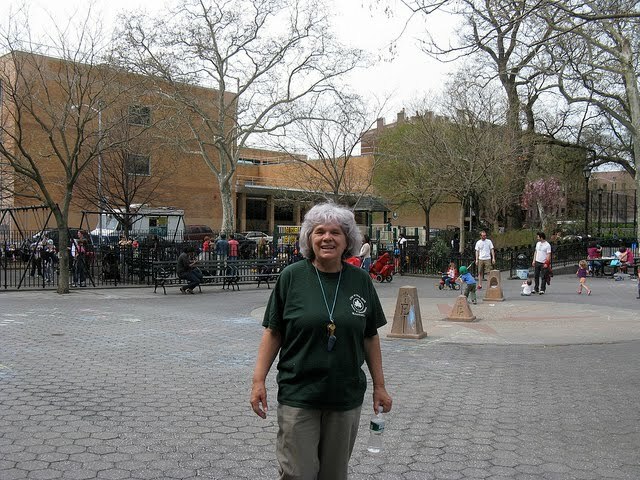 For example, on Thursday, June 23 Johnny Young, an award winning composer will perform original songs and improvise on the piano at Grand Army Plaza from 6 - 6:30 p.m.
At Brooklyn Bridge Park on June 24 from 1 - 1:30, Lois Berseth will play old standards – love songs from the 40s and 50s. These Foolish Things, Body & Soul, Because of You, When I Fall in Love, Deep Purple, etc. The complete piano schedule and map is here. Those fireworks you heard tonight celebrated the 10th Anniversary of New York Water Taxi. They were launched from an area near Red Hook, south of Governor's Island. After the theft of his family's bicycle seats (the bikes were chained out front) Brooklynian commenter VinceInTheBay says he is starting a neighborhood Night Watch in Park Slope. "Like it or not this Tenant Patrol is going to happen and it will function devoid of any N.Y.P.D presence and above all it will be modeled to reflect the makeup of the community. This tenant Patrol will not be modeled like those inbred fools in Crown Heights. Yes I said inbred because last summer I had my own run in with them as I bicycled down Ocean Parkway." 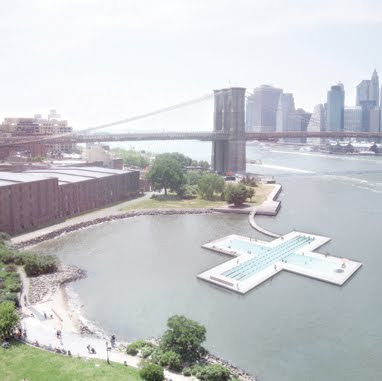 Could a Giant, Plus-Shaped Pool Be Coming to Brooklyn Bridge Park? The Brooklyn Eagle reports on an amazing plus-shaped, floating pool a trio of designers wants to tether off Brooklyn Bridge Park. An engineering company’s feasibility report has confirmed that the pool is technically possible, and enthusiasm (as measured by +Pool's Kickstarter campaign) seems to be building. The Kickstarter goal is $25,000 (to conduct filter testing). According to the Eagle, by last Thursday roughly 80 backers had kicked in $7,000. Just one day later, more than $10,000 had been raised, donated by 185 backers. When we checked early this morning, 326 backers had pledged $14,757. 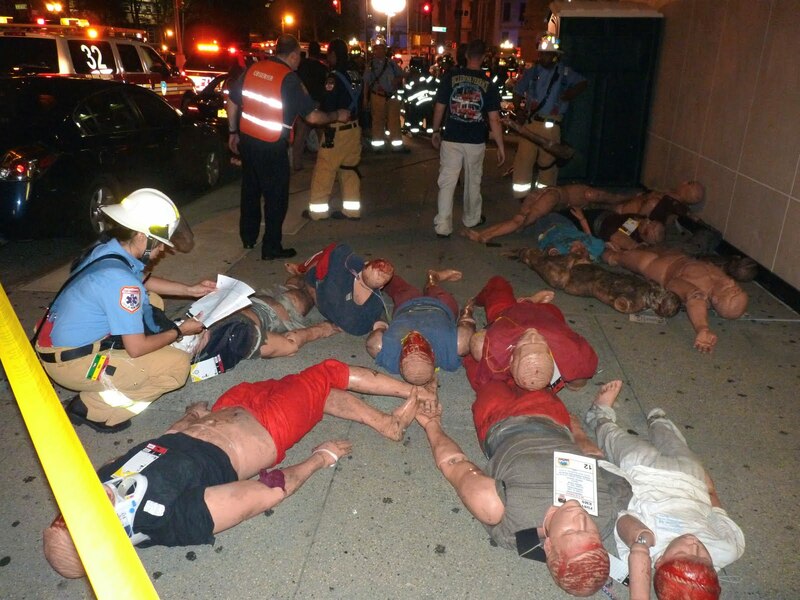 There was quite a scene Saturday night as firefighters and emergency personnel dragged realistic "bodies" out of an inferno scenario at the Montague /Court Street Subway Station. 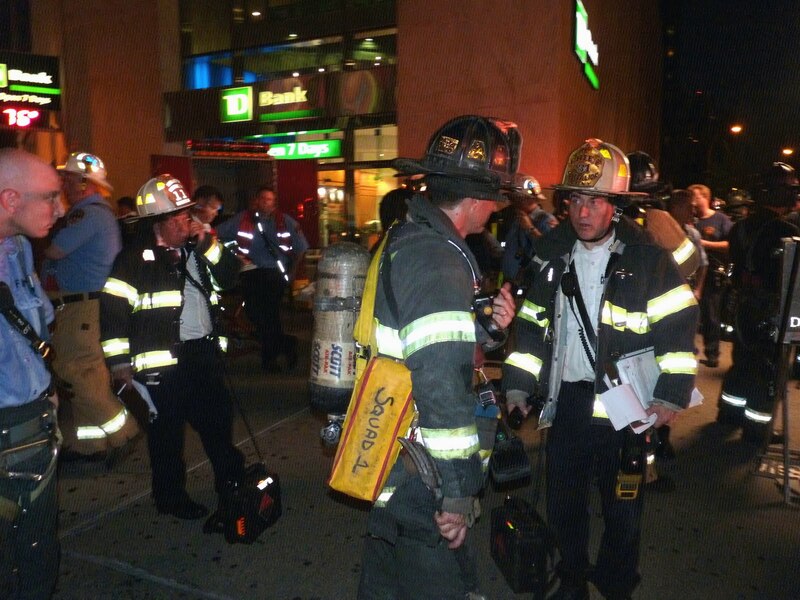 A crowd watched as FDNY and the NYC Transit Authority rehearsed a full scale emergency. The "victims" suffered bloody injuries and burns -- and some were just incinerated body parts, apparently the result of an explosion. Most victims were dummies, but we did see at least one live actor. Some had their clothes blown clear off. Dozens of emergency vehicles were stacked up and down Court Street and Cadman Plaza West along with Montague Street, which was closed to traffic. 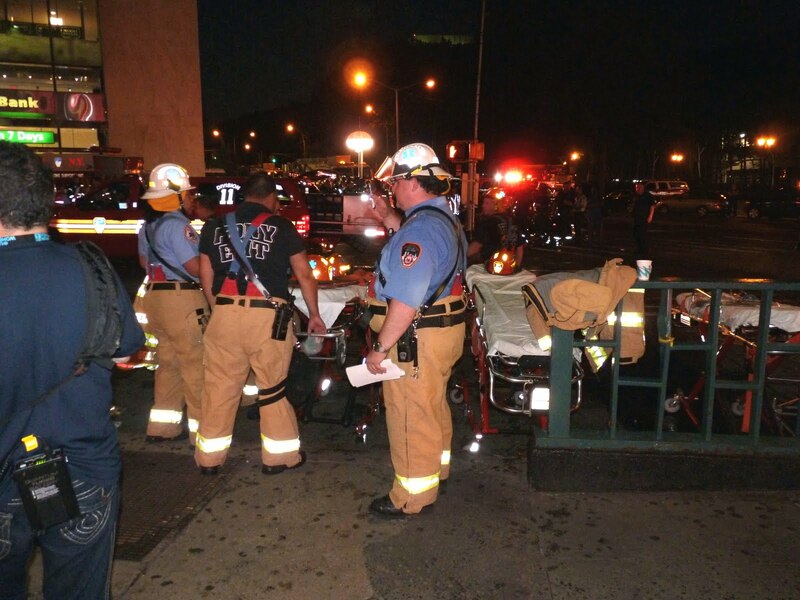 Stretchers were deployed at the entrance to the subway as the rescuers carried the injured up the stairs. 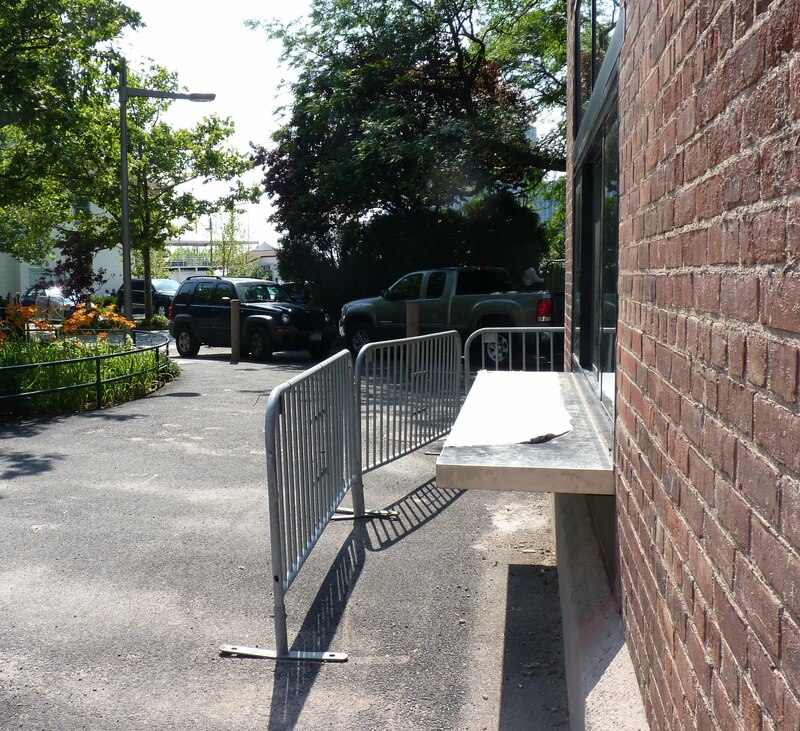 A portable command center was set up on the north corner of Montague and Cadman Plaza West. 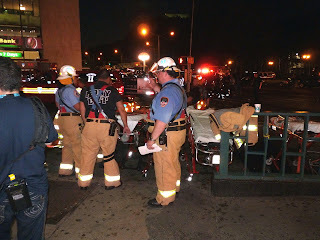 The scenario was realistically enacted, and FDNY and NY Transit showed a great deal of professionalism. Now let's hope they never have to use it. Coney Island's annual parade of sea creatures, mermaids and merguys once again ushered in the swimmy season. Photographer Bob Jagendorf took the above photo of two beautiful mercreatures. Miss the action? 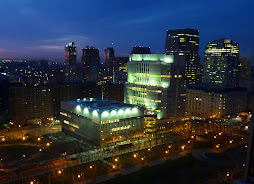 For more photos of the annual revel, visit Gothamist, Metromix, and Flickr. This well-dressed lineup cruised around Clark Street recently as part of an independent film, Propellerheart. As part of Long Island University's Summer Writers Lab, novelist Wesley Stace (aka singer-songwriter John Wesley Harding) and novelist Rick Moody will converse and perform in the Spike Lee Screening Room at 7:30 p.m. tonight, Friday, June 17. Followed by Q&A with audience, book signing and reception. Tickets: $5 for the general public. Both men are author/musicians. 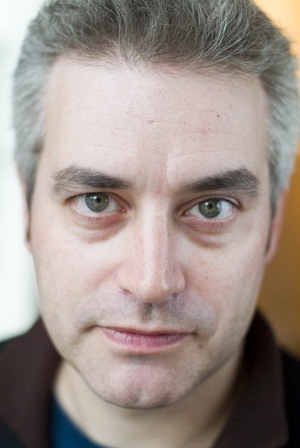 Wesley Stace is the author of the international bestseller “Misfortune,” as well as the novel “by George.” His most recent novel, “Charles Jessold, Considered as a Murderer“ will be published by Picador in February 2011. He has released fifteen albums under the name John Wesley Harding. 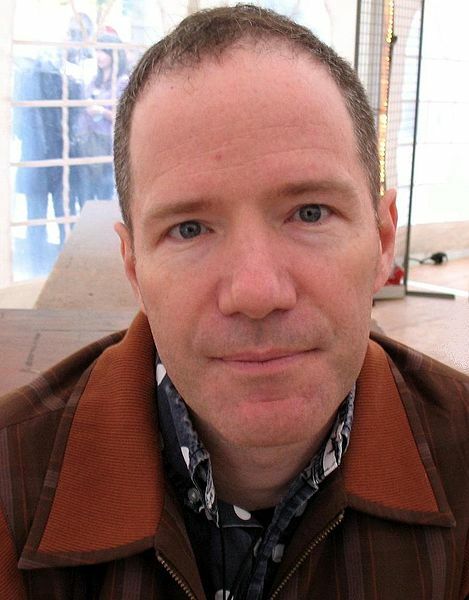 Rick Moody has published novels, short fiction and nonfiction, including “The Four Fingers of Death,” “Garden State” and “The Ice Storm,” which was adapted into a feature film directed by Ang Lee; “The Ring of Brightest Angels Around Heaven,” “The Black Veil: A Memoir with Digressions,” “The Diviners; and Right Livelihoods: Three Novellas.” His work in music has been extensive. 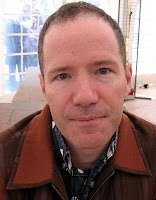 It includes the album “Rick Moody and One Ring Zero” and two albums with The Wingdale Community Singers. LIU is at Flatbush and deKalb Avenues in Downtown Brooklyn. Directions here. 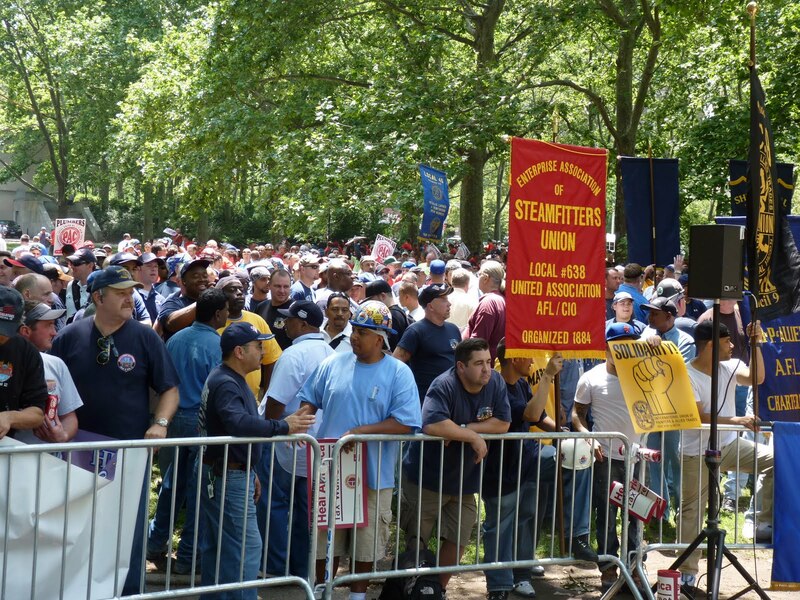 Many thousands of union members gathered for a spirited rally in Cadman Plaza Park yesterday afternoon to protest what the country (and city) is doing to middle class workers. After the rally they marched over the Brooklyn Bridge to City Hall, in what was called the "March for the Middle Class." Denis Hughes, president of the AFL-CIO said, "Every solution to our country’s economic troubles is directed at working-class men and women. 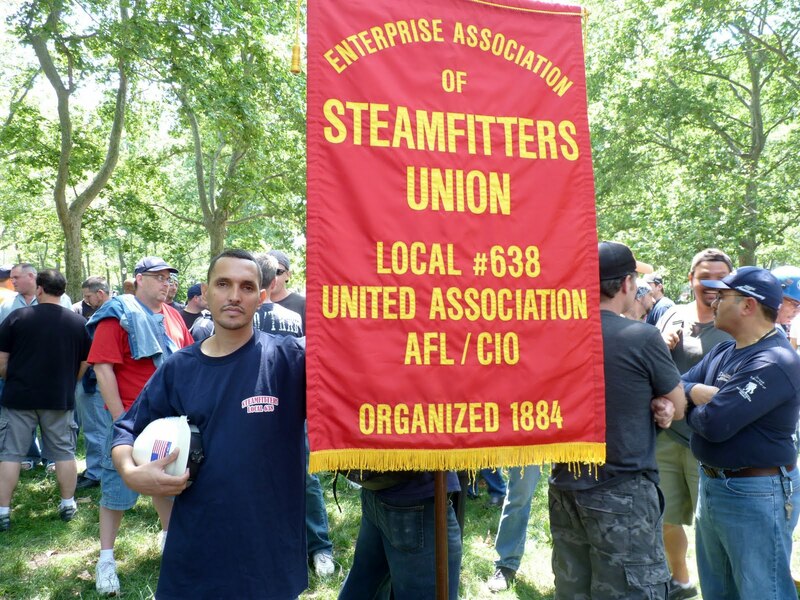 Budget cuts, wage cuts, layoffs, cuts to education, reductions in job security — we’ve had it." 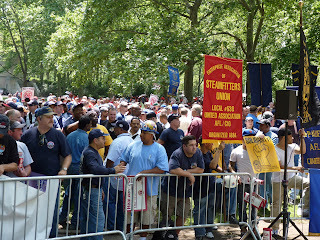 Hughes said that the union members were marching "to point out the plight of the middle class." More at the Brooklyn Eagle and NY1. 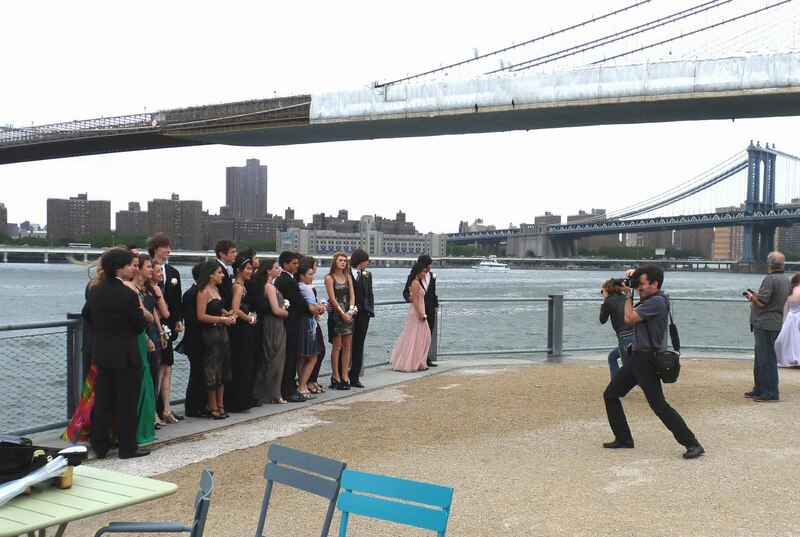 A dynamic photographer takes pictures of a wedding party on a blustery afternoon at Pier 1 in Brooklyn Bridge Park. The park is Wedding Central on weekends, with couples and wedding parties stacked up like airplanes at JFK. The new East River ferry launched Monday. Finally -- an easy and fun way to get to all the places we want to go! 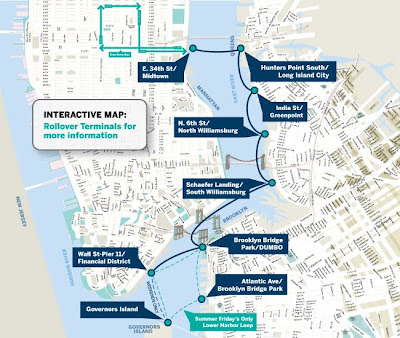 You can find the interactive version on New York Waterway's web site. 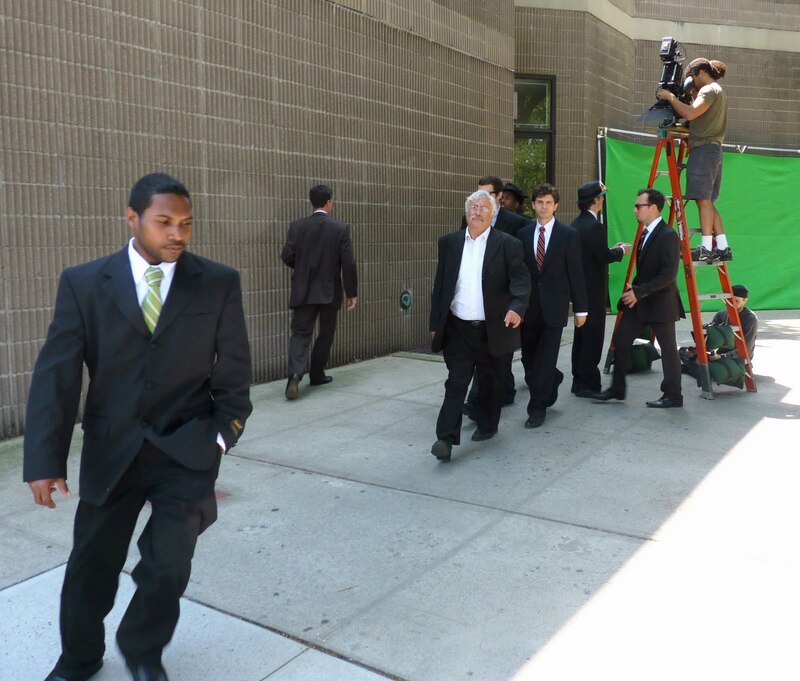 'Mayor Markowitz' How's That Sound? With Weiner no longer viable, Brooklyn Borough President Marty Markowitz is "strongly considering" a run for the Mayor, reports the NY Post. On the other hand, Markowitz told the NY Daily News that he puts the chances he'll throw his hat in ring at "less than 50-50." Some commenters on Brownstoner say "Never!" Others say that if succession is part of the deal, they might consider it. Room Eight says, "Well, at least we never need worry that there are any shots of him from the gym." Maybe not the gym, but stay out of his way in a bike lane. 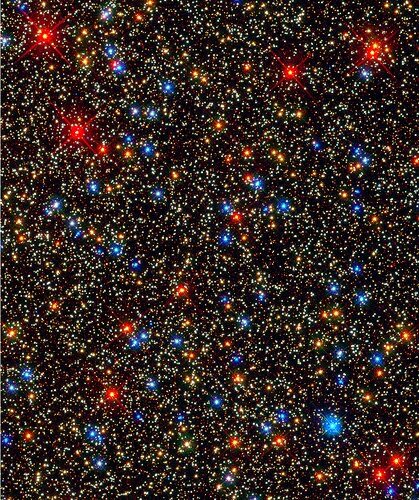 Hundreds (thousands?) 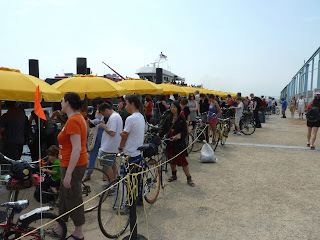 of people got the same idea we had when it didn't rain after all on Sunday -- we took the ferry from Pier 6 in Brooklyn Bridge Park to Governors Island for the annual Figment Art Show. 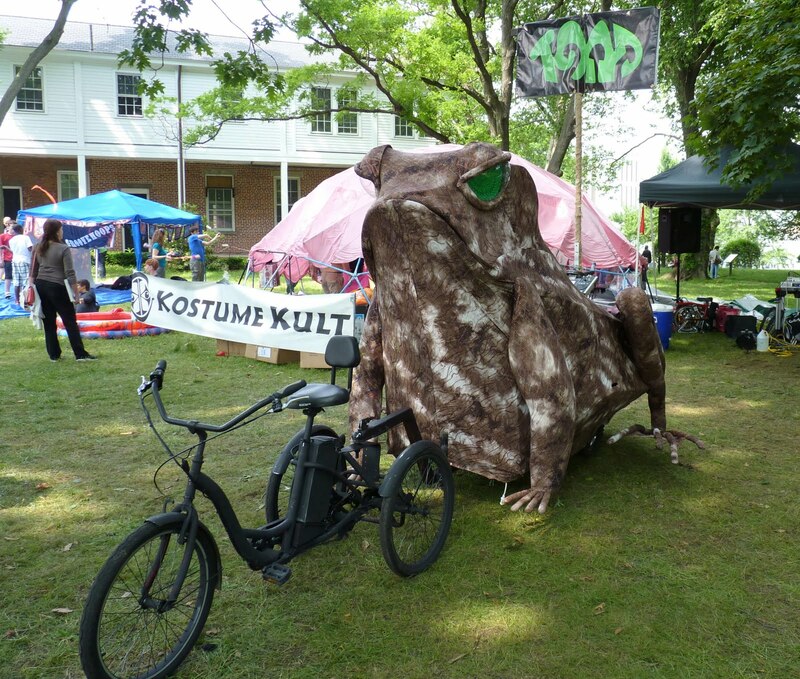 Figment is a feel-good art event where hundreds of art projects, plays, performances and improv experiences take place all over the island. 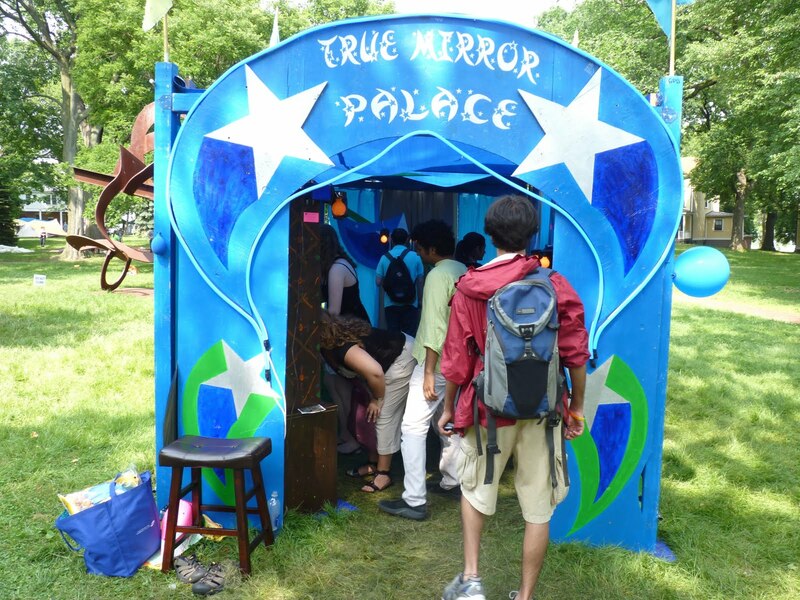 Governors Island is magic anyway, so add some art and it's just about perfect. Many of the participants wear costumes. 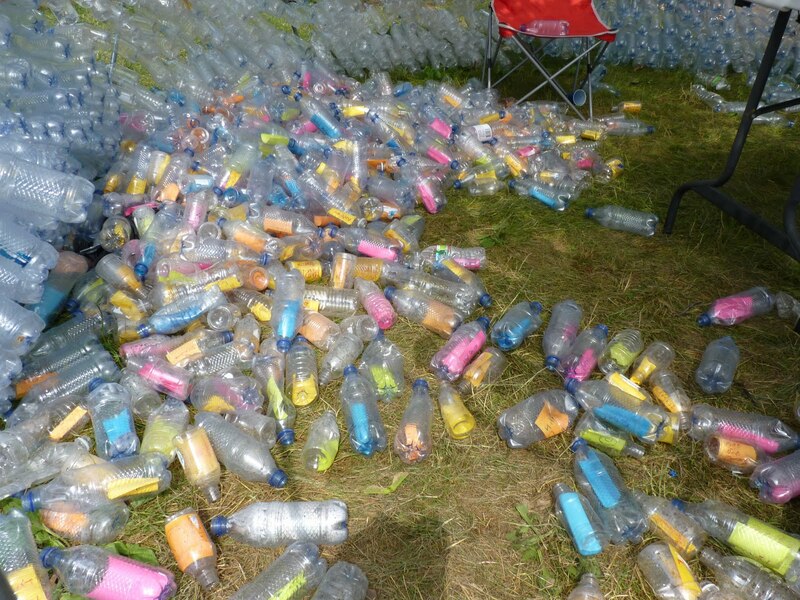 A lot of the works use recycled materials. The piece above, for example, is called "Plastic Fantastic" -- a geodesic dome made from over 6,000 used water bottles. People kept contributing their bottles all day. 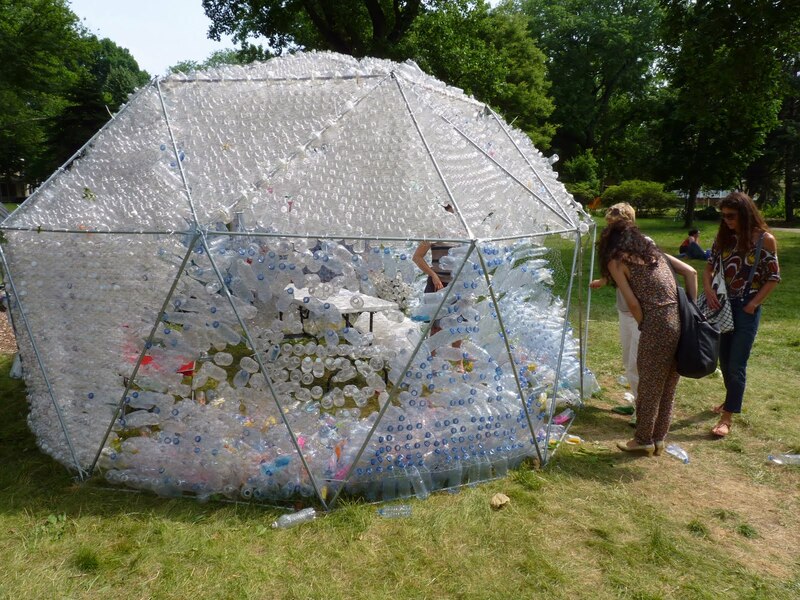 Or you could write a message and put it in a bottle, like these inside the dome. 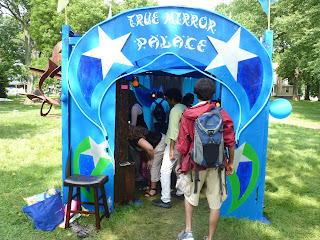 The True Mirror Palace was one of our favorite exhibits. You never think about it but normally, when you look into a mirror, you actually see yourself backwards. Subtle irregularities make the two sides of your face slightly different. So your true image looks different than your mirror image. Here's a list of all the exhibits and happenings that took place at this year's Figment. These two beloved cats are missing in Brooklyn Heights. 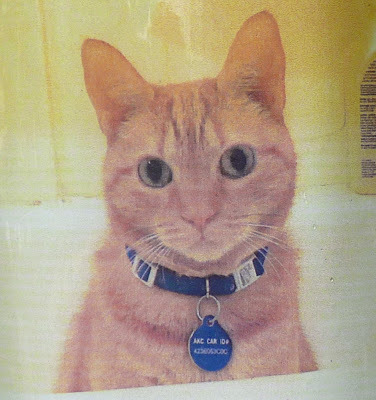 The top one, an orange tabby named Doggie, was last seen on Willow Street. Click on the photo below for more information. 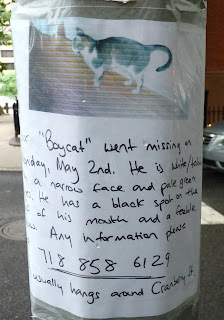 Boycat usually hangs around Cranberry Street. Click on the photo below to see more information about Boycat. 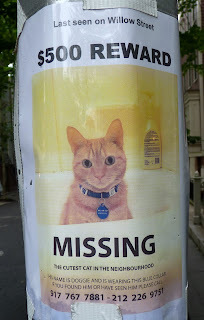 If you see any cats skulking about in the neighborhood, look closely to see if it's one of these! Big Box BJ's at Bath Beach? Don't Look Behind You But . . .
Time To Register for the Mermaid Parade!